The Priority system supports the entire purchasing process — from the creation of purchase requisitions (recommendations), to the opening of requests for quotes from vendors, to the recording of received quotations, to the opening of purchase orders, and finally to the receipt of goods and their billing. The Purchasing module enables the purchasing manager to receive online updates regarding the ramifications of his/her decisions upon the projected balances of materials in inventory. That is, the purchasing manager decides, together with the vendor, on quantities to order and due dates based on demands to acquire a specific part (including several demands for different dates) and a variety of related factors (e.g., lead time). In light of existing orders, unmet demands and the like, the system displays projected balances for the item. In addition, the dates of various milestones along the supply path are displayed — for example, the part’s due date (ship date), receipt date (arrival date), and on-hand date (the date that it is available for production, after all laboratory tests have been completed). Priority‘s Purchasing module is linked to the Financials, Marketing and Sales, Project Management, Inventory and Production modules. This linkage allows the purchasing manager to view the sales order and/or demand for finished goods that serves as the basis for the purchase requisition. Later on in the process, you can record the receipt of materials into inventory against purchase orders (reducing the order balance) and, finally, check that the itemized quantities in the vendor’s invoice match received quantities. Basic data is maintained for each vendor, including: number, name, address, telephone numbers; list of key personnel (with positions and phone numbers); specific contacts for RFQs (request for quotes), purchase orders and invoices; overall quality level; shipping mode; business sector classification; and the like. In addition, billing information is maintained for vendors in the Financials module, including payment terms, account number in the Chart of Accounts Payable, bank account details, and a remit-to address to which check payments are sent, and which appears on printed checks. Vendors that are no longer in business, or with whom you have ceased working, can be made inactive, thus ensuring that no new purchase orders will be opened for them. Maintenance of vendor data is managed via statuses using the graphic BPM Flow Chart Vendors. After defining the necessary statuses (and the paths that connect them), you can view their attributes in the Statuses for Vendors form. To distinguish a given vendor as a subcontractor, you simply open a work cell for him/her and assign the subcontractor a warehouse (defined as a plant-floor warehouse). Information recorded for vendors and subcontractors is used by Priority as default values in various documents and processes throughout the system. The system supports purchases from one-time vendors, enabling you to change the vendor’s name and address on the purchasing document without the need to open a new vendor with a separate A/P account. Priority allows you to create and maintain a list of parts supplied by each vendor. This list includes the vendor’s catalogue number and description of the part, which appear on printouts of purchasing documents (e.g., purchase order, request for price quotation). You can maintain a history of vendor parts by making old parts inactive. This feature is particularly useful if the vendor changes the VPN (vendor part number). The list of vendor parts can be created automatically or manually. You can also maintain parts by their manufacturer part number. This number is identical for all vendors of the part, yet distinguishes between manufacturers. Whenever a purchasing document is recorded, a check is carried out as to whether the specified item appears in the vendor’s list of parts. If it does not, a warning is posted. In addition to the maintenance of overall quality levels for vendors, you can also record quality levels for each item sold by the vendor. In addition, vendors can be assigned a ranking per item, relative to other vendors who supply the same part (where the vendor with the highest ranking is considered the preferred vendor). This is mainly used in the production of requests for price quotations, as well as during the selection of the vendor from whom the part will be purchased. You can maintain a separate purchase unit per part for each vendor. This unit is utilized in all communications with the vendor but need not be connected to or dependent on the unit used to maintain its inventory in your own organization. It can also serve as the basis for the unit price recorded in the vendor’s price list. Priority allows you to maintain an unlimited number of price lists for each vendor. Each price list is assigned a currency and an effect date. You can thereby maintain price lists in different currencies for the same vendor, as well as update price lists that will go into effect at some future date while saving the prices currently in effect. The itemized price list contains the prices and discounts of all the parts included in that price list, which can be defined or revised in batches. Price list maintenance is easy and convenient, including, for instance, the option of creating price lists based on lists of vendor parts, copying entire price lists, copying discounts from one list to another, and updating prices by a percentage or set value. When a purchase document is recorded, the system identifies the appropriate price list according to the effect date and part number. As the same vendor can have several price lists, Priority looks for the list with the most recent effect date to see if it contains the ordered part. As long as the effect date precedes the order date (i.e., the list is in effect), the unit price for the part is taken from there. If not, the next most recent list containing the part is offered as the default. The source of the price appears in the line item. Any given list can designate prices for regular purchases or for commission sales. For vendors with whom you have commission sales agreements, commission fees are managed per part family. These are used to calculate the commissions earned for the sale of these parts. In place of maintaining vendor price lists, Priority enables you to maintain a single purchase price per part. This price, which is recorded in the part catalogue, is then used to determine the unit price in purchasing documents. For each part supplied by a given vendor, you can designate the percentage of the part cost that should be used to calculate shipping-related expenses. You can create a kit warehouse for a subcontractor. This is an area used to prepare shipments of kits to the subcontractor in accordance with the work orders scheduled to be processed by him/her. As it is prepared, inventory is moved into the kit warehouse; once all component parts are available, the entire kit is shipped to the subcontractor’s warehouse. Priority‘s Purchase Planning module determines material requirements (both for raw materials used in production and purchased items sold to customers), based on sales orders, open work orders or frequency of need. Demands for parts that derive from sales orders or work orders are determined by production planning or Material Requirements Planning (MRP). Purchase demands for parts that are acquired on a regular basis (e.g., supplies, goods produced for stock) are calculated in accordance with fixed, user-designated requirements. • It calculates projected balances for each item (over the course of a designated period) on the basis of anticipated issues and shipments, in accordance with inventory balances and open purchase orders. • It opens a purchase demand document comprised of separate purchase requisitions (quantities and dates), taking into account lead times and other purchase planning parameters for each part. • It generates recommendations to expedite existing purchase orders when necessary and possible. One important parameter that affects a given part’s purchase planning is its replenishment type. This is determined by the manner in which demands for that part are calculated. • It can be planned dynamically, on the basis of sales orders —both for raw materials needed to produce a finished product and for parts that are bought and resold. • Or it may be required on a fixed, user-designated basis, every given number of days (e.g., supplies, machine oil, parts produced for stock). • Testing days — the time it takes, once the part arrives in the warehouse, to undergo any laboratory tests and be considered available for production or sale. Additional purchase planning parameters specified for the part include: safety stock, demand range, minimum order quantity, increment for order, and scrap. • Production Planning with Finite or Infinite Capacity – planned production which takes into consideration production constraints, the capacity of all required resources, part parameters, bill of materials, and factory modeling. • Material Requirements Planning (MRP) – planned production based on part parameters, bill of materials and factory modeling (disregarding resource capacity). • Material Requirements Planning for Distributors – issues planning on the basis of demands generated by sales orders and forecast orders (with no reference to bills of materials, production activity or assemblies). Before running any of these planning programs, the orders to be taken into account and planned must be flagged. In the case of production planning, the Priority of each order relative to the others must be specified. The three programs supply an issues plan that represents the basis for calculating projected balances and purchase recommendations. • The system takes into account existing balances in the warehouse (differentiating between inventory that is available for production and that which is not), adds anticipated receipts of goods from vendors as well as any inventory in the middle of its routing (work in progress), and then subtracts expected issues (both for production and customer shipments). Demands are created with the aim of guaranteeing that inventory levels do not fall below designated safety stock levels. The calculation of demands takes into account various purchase planning parameters, including: demand range, minimum order quantity, and increment for order. • Any existing purchase order whose expected on-hand date does not meet the demand date for the part generates a recommendation to expedite, in which a more suitable due date is suggested by the system. • Projected balances begin with the part’s opening balance on the day purchase planning was run, and reflect any future inventory developments. They also display recommended dates and quantities of orders and purchase requisitions. This provides the purchase manager with a complete picture, facilitating decisions as to whether to accept the recommendations or to make certain adjustments. Purchase orders are generated from the results of purchase planning once a decision has been reached as to what quantities are to be purchased, when, and from which vendor. The purchasing manager receives from Priority a wealth of information on which to base decisions and plan the execution of the necessary purchases, including the performance history of each vendor (e.g., supply and delivery, past prices, proven quality), price quotation comparisons, current inventory levels and projected balances. Prices and discounts are filled in automatically, taken from a blanket order, a price quote, a price list, purchase costs manually entered in a sales order, the part’s purchase price, or the part price in the previous order. The source of the price is displayed in the line item. • The buyer responsible for purchasing this item. Any purchase requisition that was created automatically may be revised. You can also open PRs manually. When a new PR is generated automatically, any old (automatically created) PRs for the same part, which have not yet been processed, are deleted, thereby avoiding double orders for the same part. Priority’s PR facility provides the purchasing manager with a wealth of information, including projected balances for each item and part price options (based on price lists, quotes, previous orders, etc.). This information enables the purchasing manager to arrive at optimal decisions. You can use a purchase requisition (even when it is still in the authorization stages) to generate requests for price quotations from vendors (see below). A fully authorized PR can be used to create a purchase order. A flag in the Purchase Requisitions form allows you to copy prices directly from PRs to purchase orders that are based on them. This flag is marked automatically when the PR price has been updated on the basis of a vendor price quote. Requests for price quotations (RFQs) can be created automatically on the basis of purchase requisitions and vendor criteria. You have the option of generating RFQs only for the part’s preferred vendor, for all vendors ranked up to a certain level, or for all vendors who supply the part. The printout of the request includes the vendor’s catalogue number and description of the part, as well as the vendor unit (as defined in the vendor’s list of parts). Quotes received in response to requests can be recorded in the system and compared. When recording a purchase order, you can base prices on a specific vendor quote or first view all quotes from all vendors who supply the part and then choose the one you prefer. The comparison between quotes from different vendors is facilitated by the system’s automatic conversion of units of measure and prices in foreign currencies into the same unit and currency for all quotes. A vendor quotation can include different prices for the same part, with different minimum quantities. When a quote of this type is linked to an order, the appropriate price is taken, according to the quantity being ordered. Each price quote has a designated expiration date. Priority offers the option of itemizing purchase orders automatically. The parts ordered, together with their quantities and due dates, can be taken from a variety of sources: a purchase requisition, a price quotation, one or more sales orders (in a buy-resell situation). The due date in the original document will be used to calculate the order’s receipt date and on-hand date (taking into account the part’s purchasing parameters, such as shipping and testing days). You can record different due dates for the same part in a single order. If the vendor in question does not supply all the items that are filled in automatically, any superfluous lines can simply be deleted. 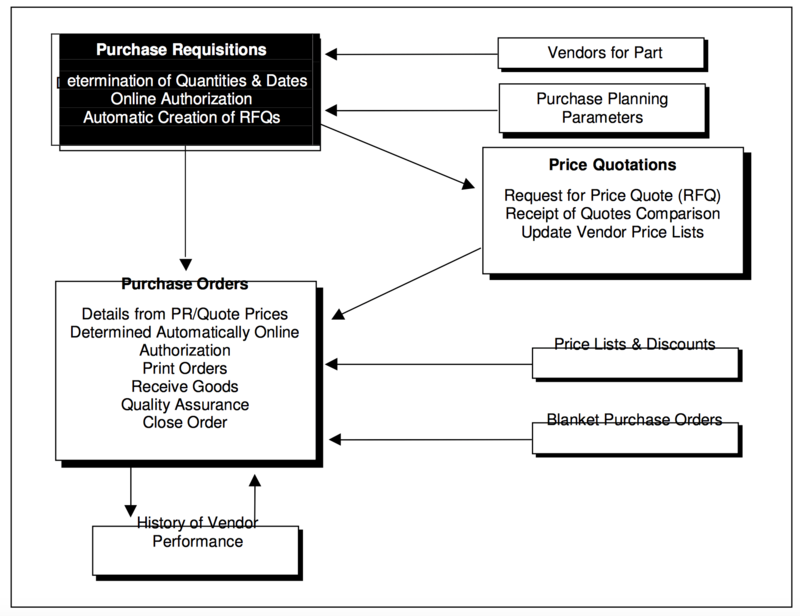 If the purchase order is based on one or more sales orders, each line in the purchase order contains a reference to the corresponding line in the sales order. • Automatic entry based on purchase requisitions (when purchase orders are opened by Direct Activation from the Purchase Demands form). • Manual entry or revision of prices when the order is placed. The source of the price is displayed alongside the unit price. If the currency of the order differs from that of the price source, prices are converted according to designated exchange rates. Order prices can be linked to a price index or foreign currency. The purchasing manager is assisted in decision-making by a broad variety of pertinent information related to the ordered item, such as: inventory balances, recent inventory transactions and price options (from price lists, quotations, previous orders, etc.). When a goods receiving voucher is recorded for a given purchase order, order balances are updated automatically. The item is closed automatically whenever its balance reaches zero or falls within the part’s defined tolerance range. Orders and order items can also be closed manually. The cost of any item in a purchase order (e.g., consulting services, legal aid, other non-inventory items) may be attached to any other part and work order; these are added as non-standard costs to the part or work order. Every order item may be linked to a cost or profit center, as well as to a budget item. The system allows you to order non-inventoried parts without having to open a separate catalogue number each time this occurs, by using a single part number and changing the part description. This revised part description is carried over to all related documents (goods receiving voucher, vendor invoice). When recording an order to a subcontractor, you can specify the work orders for which the work in question is being performed. The price in the order is then calculated as a subcontracting cost (which is added to the costs of the materials sent to the subcontractor, in order to arrive at the work order cost). The printed purchase order includes the vendor’s catalogue number and description of the part, as well as the vendor unit (as defined in the vendor’s list of parts). The shipping address can be inherited from earlier related documents (RFQ, vendor quote), or from the company warehouse for which the order is placed. • Authorizer lists–You can designate a sole authorizer or a list of authorizers, indicating the monetary amount for which each must sign. An alternate can be designated for each authorizer. The user whose turn it is to sign the order is displayed, which allows all documents awaiting the authorization of a specific user to be retrieved at once. No changes can be made in the document once there is even a single signature. Multiple lists can be created, distinguished by code. The appropriate list is designated when the order (or PR document) is recorded. With each signature, an e-mail is automatically sent to the next authorizer on the list, facilitating the rapid completion of the process. • BPM statuses–Use the BPM flowcharts to define statuses that correspond with the various stages of authorization required in your organization. Automatic messaging and workflow restrictions can be defined in the rules that govern the statuses and the paths connecting them. Blanket purchase orders offer special pricing terms in return for a commitment to order a specified quantity over a designated period of time. By definition, a blanket order generates several different purchase orders. Priority provides a means of tracking how much of the blanket order remains to be ordered, as well as the financial value of this balance. The order balance, which is originally identical to the quantity of the order, decreases as orders linked to the blanket order are placed for this part. Once the balance reaches zero, the blanket order item is closed automatically. Nonetheless, you can still open orders for the part and base them on the blanket order; in this case, the date on which the blanket order balance first dropped below zero is displayed. Every blanket order is assigned an expiration date, after which you cannot open purchase orders for it. You can view all open purchase orders and order items, according to a variety of criteria. For instance, you can view due dates, anticipated on-hand dates and projected payment dates, thus identifying any supply delays. In addition, a log displays changes made to purchase orders items. All prices in the list of open order items are displayed in the local currency. This facilitates comparisons and aids in the projection of cash flow outlays. A number of reports provide information on supply delays and vendor performance over time (actual versus planned supply of goods).